Sip wine and watch the sunset on Auberge du Soleil's romantic deck overlooking Napa Valley. 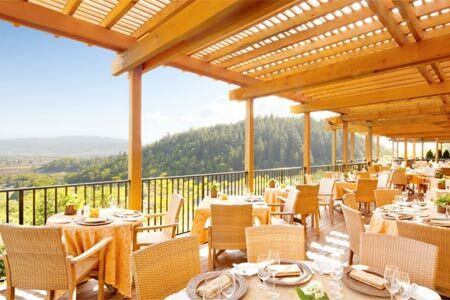 : A destination for romantic dining, Auberge du Soleil also enjoys a brisk lunch trade, despite its comparatively remote location. Nestled high in the eastern wall of Napa Valley, it boasts a deck affording views (on a clear day) all the way to the Mayacamas Range, the natural divide between Sonoma and Napa counties. It's a perfect backdrop for an afternoon respite. At dinnertime, the menu may include openers such as day boat scallop with pork belly, English peas and red curry or sautéed foie gras complemented by chocolate pain perdu and cherries. Main courses might range from Prime beef pavé to spiced local lamb, and veal wrapped in bacon with white corn, beignet, chanterelles and shallot. End the meal with a selection of artisan cheeses or choose from desserts like frozen yogurt mousse, blackberries and white velvet cake. Affable waitstaff is attentive but not overbearing, always at the ready but respectful of diners’ privacy. Moreover, they are well-versed in the cuisine from executive chef Robert Curry and the globetrotting wine list (local wines are well-represented, too) and know how to pair these elements in ways that showcase the food and the wine. Their recommendations will not disappoint, nor will the evening ambience, which is bolstered by the western setting sun that bathes the valley in amber light.